Facebook continued to dominate the social media landscape in 2012, but Google+ and Twitter introduced advertising and LinkedIn led the way to Wall Street with a successful IPO. To discuss these developments and look ahead to 2012, Online Media Daily asked Jordan Bitterman, senior vice president and social marketing practice lead at Digitas, for his views on the dynamic space. OMD: Facebook’s latest overhaul, including features like Timeline and Ticker, as well as Open Graph apps, encourages brands to create their own apps for the platform. How do you think that will play out next year as these features fully roll out? Bitterman: Publishers and app developers have real incentive to build into the Facebook graph. In doing so, they put themselves at the center of a highly sharable environment that provides both exposure for their brand and earned distribution for their content. While this immediate opportunity will create huge momentum for continued use of the platform, both consumers and brands are questioning whether the resulting abundance of push updates will create the dynamic of over-sharing -- and ultimately, burnout. On balance, we see strong growth, but will keep a firm hand on the tiller to make adjustments as necessary. OMD: A number of social media properties have started brand (or company) pages recently, including Twitter, LinkedIn, StumbleUpon, Google+ and newsreader app Zite. Will a Facebook Page still remain the anchor for social media marketing efforts? Bitterman: With 800 million users and legions of committed brands, Facebook has a huge head start. This will translate into another fruitful year for Facebook’s sales force. As the other platforms develop their brand page offerings, with new functionality and the possibility of streamlined graphics and coding standards, others will gain steam. For example, Twitter recently rolled out its brand pages, which made the site more consumer and brand-friendly. While these brand pages likely won't pull followers away from engaging their favorite brands on Facebook, interaction with a brand for the users -- and ultimately, marketers -- will be greatly enhanced. Overall, social brand pages give marketers options to connect with an audience, and numerous factors such as content, participation and listening will be increasingly critical for marketing success. OMD: What, if any, developments (or non-developments) in social media this year surprised you? OMD: Will there be a standard metric for measuring effectiveness in social marketing campaigns? Is one needed? Bitterman: Digitas has been working both on our own and with industry partners to solve the equation. Generally, however, trying to measure effectiveness in social is analogous to doing so in brand and direct marketing: Every client is different and every client situation is different. The value of a fan or a follower depends on what you intend to do with them once you acquire them. The value of a connection on one platform is different than the value on another. Ultimately, we are making great progress toward standardization, but it will be a marathon in getting there -- not a sprint. If anyone says differently, don’t believe them. OMD: For Digitas clients, what proportion of their digital budgets goes to social media, and what portion to earned or owned media versus paid advertising? Bitterman: Investment in owned and earned channels is adopting rapidly. Hype is driving part of this shift. Brands are also realizing that in the social age, working media simply doesn't work well on its own. Still, even at strong growth multiples, it’s challenging for clients to take the plunge. The paid media ecosystem –- and the associated metrics -– have been an established driver of objectives for decades. For the next ring of dollars to move to line items beyond paid media -- owned and earned live in this column -- innovator brands such as American Express and P&G will have to show the way. OMD: Do you have any thoughts on what trend(s) in social media might emerge next year? 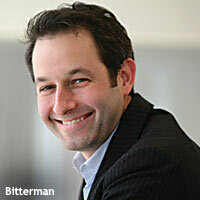 Bitterman: Driven by the opportunity for exponential ROI gains, brands will embrace social commerce more fully in 2012. Consumers will become more comfortable buying through technologies on networks, and the technologies themselves will become more mainstream and reliable. Social will prove to be the “killer app” that drives mobile growth and adoption. Two-thirds of Americans are on Facebook and three-quarters visit social networks regularly, yet smartphone penetration is at just 50%. Social will be a force to push that figure higher. Investments in initiatives that stretch beyond paid media -- so-called 'non-working media,' such as development costs for brand pages or social applications -- and the buildout of the content that populates those experiences, will continue to scale as innovative case studies demonstrate an effective path forward. 4 comments about "Digitas' Bitterman On Owned, Earned And Hype -- And Why Google+ Has Been A Negative". Kevin Bullard from ILFUSION Creative, December 27, 2011 at 8:05 a.m.
Chris Nielsen from Domain Incubation, December 27, 2011 at 10:47 a.m. I think the demand to have apps and sites that are socially amplified will only increase. But like the crumbling of the former USSR, I expect any top sites that appear to follow the MySpace pattern if the operators don't wise up and listen to users. Google now seems to be in the spam tools business from my perspective. First they refused to drop linking as it became a widely-abused metric, and now they give us G+ to make spamming even easier. I don't know what all this linking and plusing has to do with keyword relevance for a search? Huard Smith from Merkle, Inc., January 3, 2012 at 10:56 a.m.
Keywords aren't a good way (alone) to determine which pages/sites have valuable content. That myth was exploded more than a decade ago. Google's always on the hunt for the best way to determine page relevance. Links were the way the collective Internet voted on which pages were the best. While there is still no better way to do it (even though it is not a perfect system), Google is now trying to add social cues -- things might be more relevant to you if your social network thinks they are. But Google+ is a closed system (no Facebook, Twitter, etc.). The thing I would add to Jordan's list about 2012 is that this may be the year in which we make progress towards a common approach to incorporating social cues into search. That will involve Facebook, Twitter, LinkedIn, and Google, just to start, which seems daunting. Baby steps in 2012. Nick D from ___, January 3, 2012 at 4:32 p.m. But this hardly moves the discussion any further. "Facebook is greeeeaaaaat, man, and well worth spending dollars on". 'With 800 million users and legions of committed brands, Facebook has a huge head start.' - but you're conflating time spent with *quality* time (for brands) spent. The time I spend playing with my fingernails does not mean that a brand should advertise on my fingernails, for example - the much smaller amount of time I spend with a trusted newspaper is actually higher quality time for any brand wishing to reach me.